Not just books. Point out and read out loud street signs, labels in the grocery store, episode names on TV shows, words you see all around you both in daily life. Read poems and books that rhyme: nursery rhymes and Dr. Suess are popular for good reason! Make games out of finding words that rhyme. Makes up silly nonsense words that rhyme with your child’s name: Emma, Shemma, Lemma, Bemma, Wemma! Talk with your child about the stories you read together. What do you think will happen next? What clue does the picture give you about what might happen next? Did this character make a good choice? What would you do if you were the character? What was your favorite part of the story? I remember as a kid that my mom had this huge coffee table book about gardening, filled with all these beautiful pictures. I decided to “read” it (before I could actually read) and spent time over several days laying on the floor looking at every single page one at a time until I’d gotten to the end and had “read” the whole thing. I was quite proud of myself. And all because this book just happened to be sitting there on the table where I saw it every day. Keep a variety of books and other reading materials available to your kids. Picture books, novels, magazines… stories and non-fiction books about a variety of topics. I started my “collection” of books by going to used book stores, where I could find a wide variety of options for $0.25 or $0.50 each. 5. 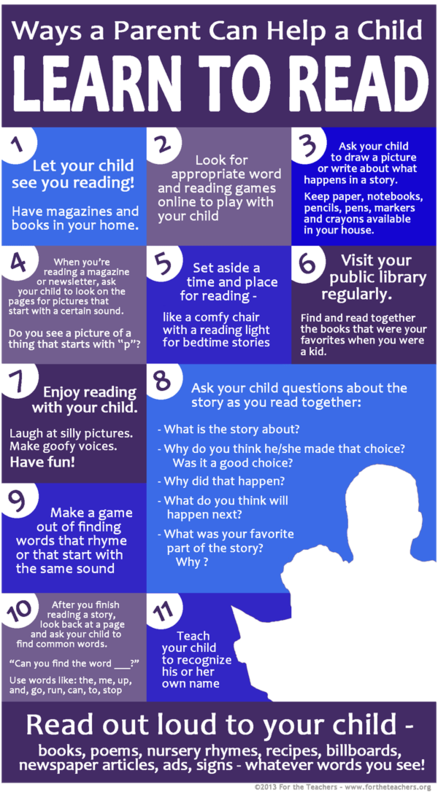 ENJOY READING WITH YOUR CHILD! Have fun with it! Make goofy voices. Laugh at the funny parts. Point out silly pictures. Show your child that reading is something to enjoy and share.